Today’s POP RESCUE is Silk & Steel – the 1986 second album from five-piece sibling group, Five Star. This 10 track album came hot on the heels of their debut Luxury Of Life – which was released the year before – and it spawned 6 UK singles. The album opens with lead single Can’t Wait Another Minute, signalling that the group are excited to be back with album 2. Deneice has the lead here, and her wonderfully rich purring vocals make light work of both verse and chorus, and is flawless on the high notes. Some great 80s synths provide her and the rest of the group with a great up-beat, fresh, pop sound. There’s even time for a pop rock guitar solo mid-way. This song is truly 80s, and a wonderful little gem. Unsurprisingly, this single would be a hit, reaching #7 in the UK in 1986. This is followed by second single Find The Time, which continues the slick pop production, and matched its predecessor in the UK chart at #7. This song opens with a nice plodding bassline and 80s beats. This is swiftly joined by a scattering of vocal samples before Deneice takes the mic. I really like the melody on this track – it flows perfectly and gives a great contrast to the bass. The vocal harmonies from the rest of the group during the chorus are wonderfully warm. Biggest UK hit, Rain Or Shine follows this, a song with the lyric that gives the album its title. I remember this song being released, and sitting with my sister listening to the chart show (recorded to cassette of course). Again, slick production makes this a simple but catchy pop song. Mixing legend Phil Harding is on the dials here, and he’s joined by serial 80s Obligatory Saxophone player Gary Barnacle – both of whom worked regularly with those other pop svengali at PWL. Whilst it was robbed of being #1, it settled for #2. Up next is If I Say Yes, which sees the group take on a slightly bubblegum pop song, a sound that almost feels like it could be a later remix of an early Jackson 5 song. This feels a little weaker than the three previous songs, and the UK chart placing of #15 reflects this. Whilst there’s nothing fundamentally wrong with this song, it does feel a little lighter. Having earned a bit of a breather, Deneice steps aside to let her little brother Delroy take the vocals on Please Don’t Say Goodnight. This song is a slow ballad, backed by a sweeping set of strings and soft vocal harmonies. This song would have closed side one of the vinyl version of the album (the main format for this album at that period), and so would have worked perfectly as a closing track. Sixth track Stay Out Of My Life is up next, and this song is a little muted in the verses, but picks up in the chorus. There’s plenty of rockier beats, guitars and bass here, and Deneice’s vocals (she wrote and co-produced this song too) are a bit rockier here too particularly in the mid-section where she really goes for it. The song gave the group another top 10 UK hit, reaching #9. Show Me What You’ve Got For Me follows this, and this is a stronger track. The chorus is particularly catchy, and once again Deneice makes light work of the vocals. The song has a great combination of slinky bassline and blasts brass. Are You Man Enough? is hot on its heels, and delivers another great wandering bassline, with some funky wahwah guitar. The song gently builds as Deneice weaves her rich vocals through its verses and choruses. It even includes a flute and flugel horn. This track was released as a single in the US, but I can only imagine that it was edited down, as the song does feel slightly too long at 4m 38s. Penultimate track The Slightest Touch, gave Five Star their third biggest hit, reaching #4 in the UK. This song has some wonderful synths, and Deneice is given plenty of space to show off her vocal scale – and she really shines. Her siblings give her plenty of perfect vocal harmonies, whilst her vocals are interspersed with synths – all helping to really make it feel fresh and upbeat. Deneice hands the mic over to big sister Doris, who gets to close the album with her self-penned Don’t You Know I Love It. This is an up-tempo pop track, and Doris’ vocals suit it perfectly, including some wonderful little ‘aha ooh ooh‘ vocals that almost give it a nod to an era past. Over all, this is yet another brilliant album from Five Star, just a year after their debut. The total seven singles worldwide, ensured that they were kept in the limelight, and whilst probably a gruelling schedule, it enabled them to run a string of hits – with this album serving up some of the most memorable hits. Stylistically, it’s not much further along from their debut, but that doesn’t matter right now. Do watch all of the videos from this album’s singles – they are fantastically 80s, and absolutely mesmerisingly creative. 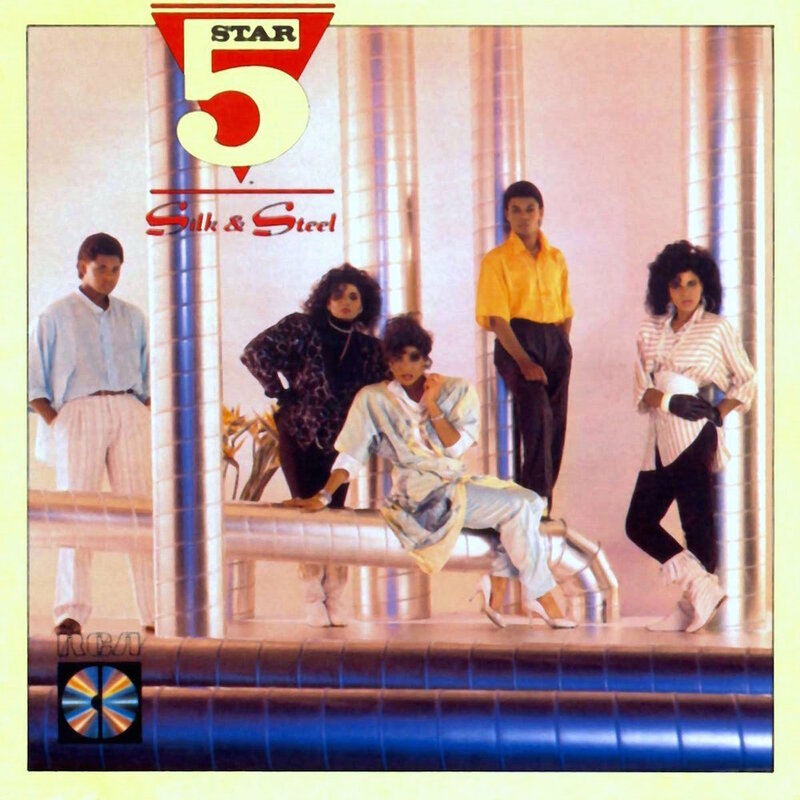 Five Star found great success with this album in the UK and Europe, but less so in the USA, where it stalled at the lower end of the Billboard 100. In true tireless Five Star style, third album Between The Lines was released after a year, followed by their fourth album Rock The World the year after that. The group have enjoyed a renewed success, although not to the commercial chart levels of their 1980s career. They’ve continued to perform, although currently perform as a four-piece. Deneice has enjoyed moderate success as a solo artist, releasing her debut solo album Imprint in 2014. She has also recorded with a range of artists including Matt Goss from 80’s boyband Bros. The album was re-released by Cherry Red Records as an expanded edition in 2010, featuring a number of bonus tracks including remixes by Shep Pettibone. 1986 UK CHART POSITION: #1, certified 4x Platinum. POP RESCUE COST: £1.50 from an eBay seller. Posted in 1980s, Five StarTagged 1986, 5 Star, album, Can't Wait Another Minute, Delroy Pearson, Deneice Pearson, Doris Pearson, Find The Time, Gary Barnacle, If I Say Yes, Phil Harding, Rain Or Shine, review, Silk & Steel, Stay Out Of My Life, The Slightest TouchBookmark the permalink.